April is best known for playoffs and spring. Seeing as how spring has failed to make an appearance so far, we shall content ourselves with the playoffs, NHL and NBA variety. Under Brendan Shanahan the Toronto Maple Leafs have done most everything right. Tank. Draft well. Hire the best managers/ coaches. Emphasize skill. Fill the ACC. There is something that normally follows all this. Winning. But as Shanny’s young Buds have discovered, winning is the hardest part. Currently the Leafs are getting a weapons-grade thrashing from the grizzled Boston Bruins on the art of turning tanking into triumph. 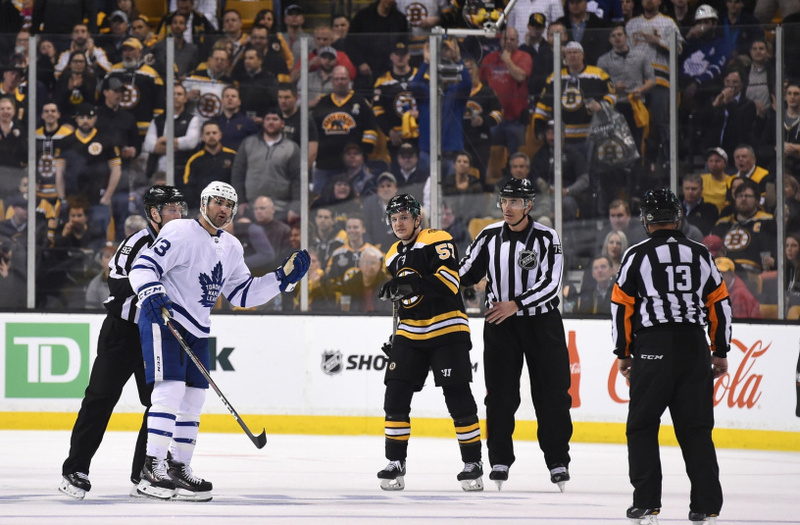 Anything that could wrong has gone wrong— including the three-game suspension to Nazim Kadri. Proving that Wishin’ and Hopin’ was a great Dusty Springfield song, but it will take more than that to get Toronto to its first Stanley Cup. 2) This is bad news for Rogers Communications which looks upon the Leafs the way Wile E. Coyote looks upon the Roadrunner. A tantalizing prize just out of sight. A Stanley Cup to Toronto would produce dividends galore for stock holders and save the Brobdignagian deal it signed with the NHL for Canadian national TV rights. They have patiently waited for the Leafs, but you have to imagine this spring’s scuttling by Boston must be testing the executives across town. Thank goodness Rogers has a fallback position in the person of the…. 3) Winnipeg Jets. All the techniques currently being used in Toronto to create a winner have been followed in Winnipeg. The Jets have stunk for almost as long as they’ve been back in Winnipeg. Knowing they could not attract premium free agents to the Peg the way Toronto can lure them to Hogtown, GM Kevin Chevaldayoff drafted assiduously and traded strategically to assemble a winner. Even as recently as last season (when they finished 25th overall) the Jets’ formula seemed be souring. But this year has brought the ripe fruit to the tree. Despite a Game 3 loss, their manhandling of the Minnesota Wild in the first two games of their opening-round series, shows that the Jets are— exclusive of injuries— a legitimate threat to win the Western Conference and make a Final appearance. Which would be…. 4) A godsend for Rogers which needs a Canadian storyline. A loss in the first round would be… hey, how about those Blue Jays? 5) Then there are the Vegas Golden Knights. They’ve been in existence since last summer. They won the Pacific Division. They’re up 2-0 on Los Angeles. How does this small sample size speak to developing a winner in today’s NHL? Discuss amongst yourselves. 6) The sentiment remains that anyone in the West wishing to go to the Final will have to make a trip through Nashville. The Preds, who held serve in the two games in Nashville, are blooded in the playoffs, have a fanatical following and, if they can get Vince Gill off the road with The Eagles, the best in-arena entertainment in the league. 7) Winning Game One of a series means a lot. Unless it doesn’t. You still have to win 15 more games to win the Cup. As the two-time defending champs from Pittsburgh discovered. After pummelling Philadelphia in Game One of their Pennsylvania Grudge Match, the Pens found themselves getting ripped 5-1 by the Flyers in Game 2. (The Pens then put up a 5-1 win Philly in Game 3.) One thing is sure: the most consistent marker for any Cup winner is health. Playing too many games early is never a good thing. No one has played more hockey the past three seasons that the Pens. They don’t need to get into seven-game slugfests. 9) The Tampa Bay Lightning. Steve Yzerman has assembled a terrific (healthy) squad after last year’s playoff miss. They’ve effortlessly handled the up-and-coming New Jersey Devils in the first two games of this series. And while the Devis are far from done, this looks like a Lightning year. A TB/ Pittsburgh series would be ridiculous fun. 10) The NHL still allows 100-point teams eliminated in the first round and 90-point teams getting cozy matchups into the second round. This is because the head office still thinks it’s the 1980s and divisional rivalries are paramount. News to Gary: NBC and Rogers want the best teams regardless of division to make the final two rounds. It’s 2018. Make the adjustment. 11) Finally, everything went right for the Raptors in Game One against Washington. When Kyle Lowry and DeMar DeRozan started slowly, C.J. Miles (12 points) and Serge Ibaka (23 points) rained down three pointers. In the second half DeRozan and Lowry re-emerged to overwhelm the Wizards and their star John Wall. Delon Wright popped in 18 to close the deal. It was the Raptors’ formula incarnate. Depth, depth and more depth. It worked well all season for the Eastern Conference winners. Now if coach Dwayne Casey can use seven players to cover LeBron James when they meet the Cavs, it might get Toronto to the Final.